If there is one thing we can all agree about Star Wars: The Last Jedi, it is that we didn't get nearly enough porgs. Those curious critters have a whole ecosystem and set of behaviors that will have us hoping to get back to Ahch-To for ages! Rapid fire knowledge: Baby porgs are porglets; they hunt crustaceans but we have no idea how they crack the shells; they understand many words, especially food-related ones; males have orange feathers on their face; they love being scratched behind the ears; a group of porgs is called a murder. ... What!? We might lack all the information about the porg that we want, but we do have options. Observe even more curious behavior when your pooch goes the way of the porg with this The Last Jedi Porg Costume for Pets. The half coat gives your four-legged friend the look of the strange and curious aquatic, flightless, feathered birds(?) on Ahch-To. It came as quite a shock to see just how much porgs have in common with our domesticated best friends. Between treats and scratches, they're practically pooches! 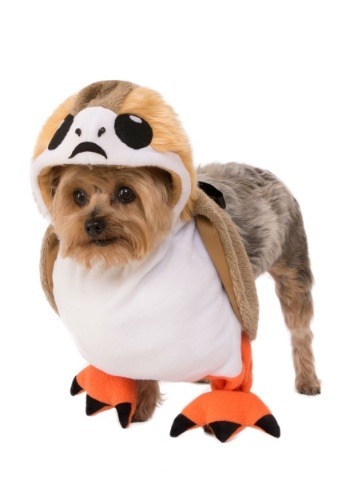 Have your own personal hybrid with this Pet Porg Costume. But, we figure a group of pet-porgs should be renamed into a "cuddle."